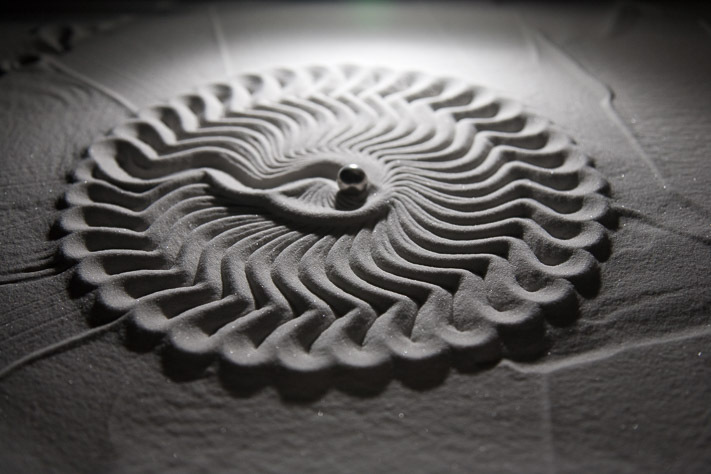 The sand table is a functional piece of art. 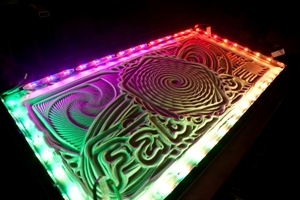 It is a complex electromechanical device within a coffee table that draws patterns in sand. A steel ball bearing sits on top of a pan filled with sand and is moved by a magnet hidden underneath. 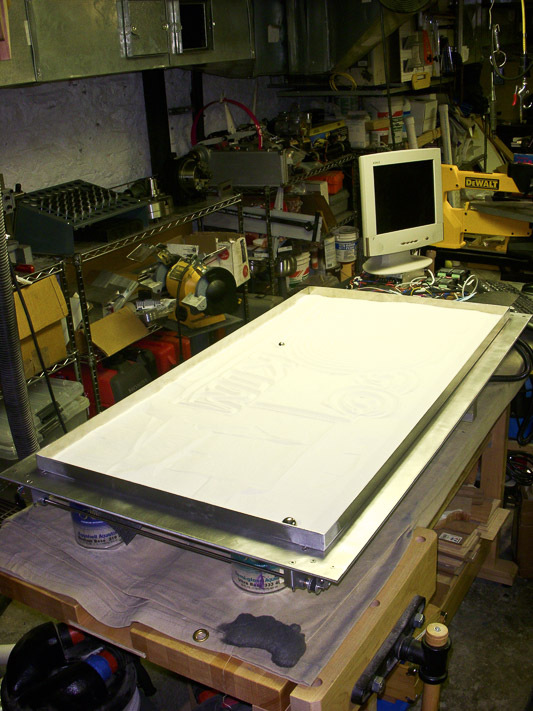 The magnet is driven along two axes by a gantry controlled by a computer with a web based interface. In 2004 my family and I stayed at Dean Kamen's house over Christmas and had a wonderful time. Dean is a prolific inventor, creator of the Segway, and holds hundreds of patents. Each year the folks at DEKA, Dean’s world class invention and prototyping company, build him a one of kind holiday present. They create machines that blend sophisticated craftsmanship with interesting scientific principles and/or something related to Dean or DEKA. When we arrived I helped him get his latest present working - a dynamic magnetic-suspension machine that could float a lit light bulb or a spinning helicopter. Throughout Dean's house there are other presents - a custom made pinball machine, a 100 ton Möbius coin press (one sided coins! ), a chess playing robot, and more. I wanted a cool machine similar to what Dean had, but I didn't have the staff to make one for me. Soon after staying at Dean's house I contracted "fifths disease" in my shoulders. Normally a children's disease, in adults it causes severe joint and muscle pain. In my case it got my shoulders and made it difficult to do almost anything with my arms.The virus provided the downtime to think up and draw plans for the sand table. I started machining parts as therapy when the illness cleared to get my strength back. Yes. If you know how to use a mill and a lathe it is relatively straight forward. 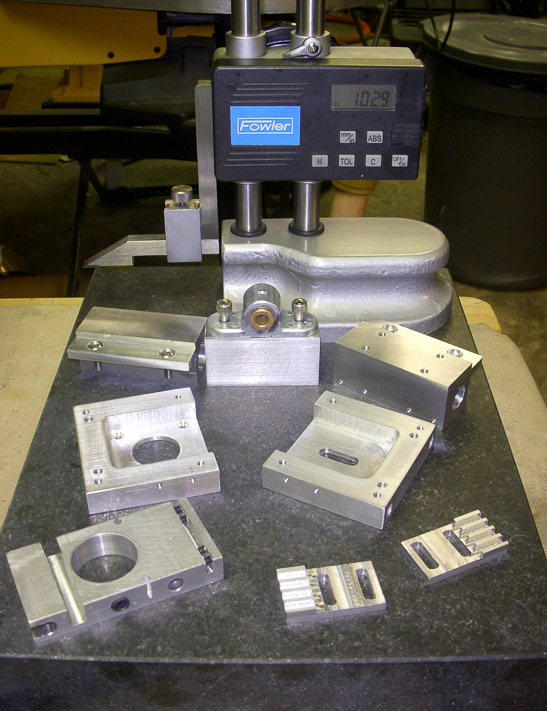 All of the parts were machined by hand or obtained from parts suppliers. The parts were designed with Autodesk Inventor and the CAD files are available. Instructions will be posted in the future. In the interim, contact me at mike at dubno dot com. The table has a web based interface that allows a user to draw about 30 different types of patterns with lots of parameters. Everything from spirals, snow flakes, text, clipart and mazes to fractals and strange attractors can be drawn. Everything is written in Python making it easy to add new patterns. The software runs on Raspberry Pi and Beaglebone and generates G-Code which is then sent to a Tiny-G controller. I've hooked a camera up to the computer and written some software that lets me make stop-motion animated movies on the table. It is completely automated and uses a scripting language (xml) to interpolate and morph between images. Check out the sample animation. 180 color LEDS have been added around the perimeter which are controlled by 18 different patterns, each with their own parameters - sometimes the sand appears to move simply by shifting shadows. What else may it do in the future? A 3D printed version of the mechanism has been created and still needs a little more work. Switching out the permanent magnet for an electromagnet and using a tray filled with iron filings. Heat-activated binder in the sand to create permanent pieces. Attaching a simple gate to the sand tray that would allow a fixed-magnet table to change balls. An eraser made with a ball bearing and saucer shaped piece of aluminum.